Shorts in this price band are perfectly good for hillwalking and backpacking. Pockets will allow easy access to maps or guidebooks while wearing a rucksack, and zipped pockets will provide security. Fabrics in this price range include durable nylon options that are also fast drying. Belt loops will generally be present on the waist and in some cases a belt may be provided. There may be some elastication in the waistband for more comfort. You may also be able to find stretch fabrics. However, in general at this price these more practical features may be more difficult to find compared to higher-priced options. In this price band it is relatively easy to find very good shorts that boast all the main features you need. Expect to find tough nylon fabrics that are fast-drying and durable. Stretch materials are also more common in this price band. You can often get a plethora of pockets and these will include OS map-sized pockets as well as zipped security pockets. The waist may benefit from elastication, a belt and a brushed lining for more comfort. 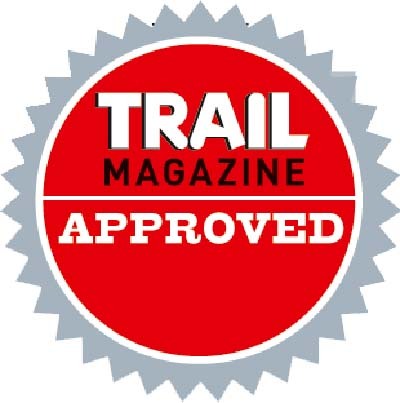 You may also get additional durability from double layers of material on the seat to make these shorts even more hardwearing when resting on the trail, which is great for more regular users. These have the most accessible map-sized pockets of any shorts I have tried. Four massive pockets swallow maps with ease. You get an additional pair of front leg pockets that are smaller and one has zipped access. The waist is elasticated and has a fitted belt. You get a gusseted crotch and these are quite spacious shorts so freedom of movement is great. The material is a tough nylon (Bluesign approved for environmental benefits) and there’s a double layer on the seat for more durability. These are superb for the price. The sizing is slightly bigger than others I found, so it would be worth trying a size down from normal. The waist does not get the softer lining of higher-priced shorts and there is no stretch in the main fabric. The front pockets are mesh, so could be less durable than others. The only zipped pocket is on the right lower leg pocket, but for keys having a zipped pocket nearer the waist would be better so heavy items don’t bang around. The women’s version does not get the in-situ belt in the waist. Extremely well-priced, with superb pockets for maps and a great waist design, but check the sizing carefully. These are the short version of the iconic Rohan Bags trousers. I was wearing both back in the ’80s and they are still superb. They have a fantastic set of pockets – four on the front all taking maps with two of these being zipped, and on the rear two more zipped and map-sized. A neat touch is a press-stud bellows panel on the sides so you can have more spacious pockets. The waist has belt loops and the seat has a double layer of material for more durability when resting. These shorts are slightly shorter than others – which you may value as a minus or a plus! There is no women’s version though, which is a drawback. The material has no stretch, while the waist has neither stretch sections nor a soft lining, so others are slightly better in this area. Although you get belt loops, there is no belt provided. Overall the comfort and fit is not quite as good as others. Some may feel they look a little too practical with their rather square patch pocket design, so more stylish walkers may prefer others. But for performance there’s not a lot wrong here. Superb pockets for easy access to maps or guidebooks, but others are slightly better in terms of fit and comfort. The styling here is more relaxed than other shorts in this price band, but you still get good features. The material is a tough nylon, while the waistband has belt loops and a soft-brushed fleece lining for more comfort. The two main front pockets take an OS map with ease, and the zipped leg pocket takes a map to half length. There is a very useful hidden zipped security pocket inside the hip pocket, which is great for keys. There is also a rear zipped pocket. The waistband isn’t elasticated, so these shorts aren’t quite as comfortable in this area, and no belt is provided. The main fabric has no stretch, so you are reliant on the cut of the shorts to provide the freedom of movement, and the lack of crotch gusset means these do feel slightly more restrictive than some others. Some shorts have even more pockets and the mesh lining in the pockets means they are not as durable as, say, nylon panels. Also other shorts offer double layers of material in the seat for more durability when sitting. Good general hillwalking shorts with a softly-lined waistband and nice pockets, but some small details are better on other shorts. The Parameta A fabric used in these shorts is designed to wick and spread moisture across the surface for faster drying, while the nylon adds more durability. The waist is elasticated, with belt loops and a belt. The pockets are particularly good, as the left leg patch pocket swallows an OS map with ease and has an internal zipped pocket, while the right pocket is shorter so ideal for guidebooks. The other two waist pockets also take an OS map easily, and two rear zipped pockets are great for security. I found the fit to be quite spacious. I found these shorts to be slightly oversized compared to other size L options I received, so I’d suggest trying a size down from normal. The material offers no stretch, so this may in part be why the fit is rather loose. Also, the waist is good but higher-priced shorts have a more comfortable brushed lining in the waistband. The cotton in the fabric means they don’t dry as fast as purely synthetic fabrics either. And there’s no women’s option. 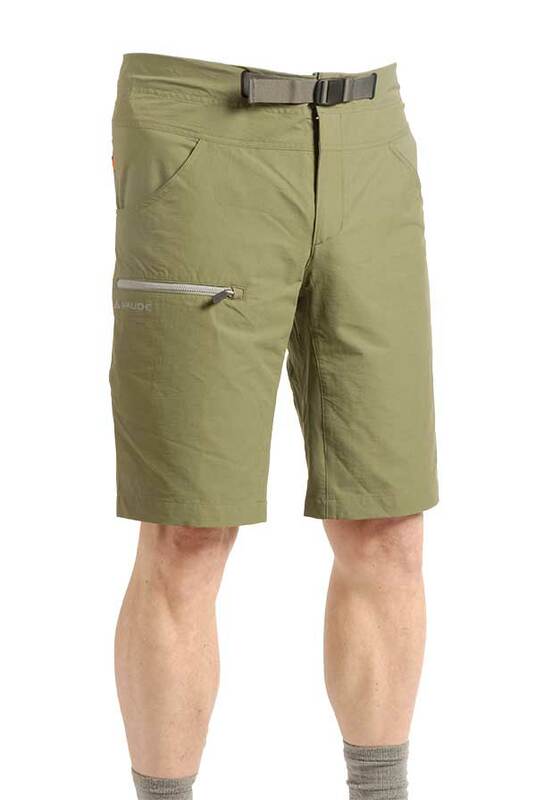 Excellent shorts for backpacking, trekking and hillwalking at a superb price, but there is no women’s option and small details are better on others. The nylon-based fabric is durable, water-resistant and fast-drying, but there is also some stretch which adds to the comfort. The wide waistband has some stretch and a brushed microfleece lining for comfort. Belt loops and a belt (men’s only) mean you can adjust the fit. The rear and leg zipped pockets are fine for small items, and you can slot a map into the two hip pockets very easily. Fit, comfort and freedom of movement are all good, thanks to the stretch and a wide panel between the legs. Some shorts have even more stretch than offered here, particularly in the waistband. Others also use a heavier fabric that is more durable in the roughest terrain. 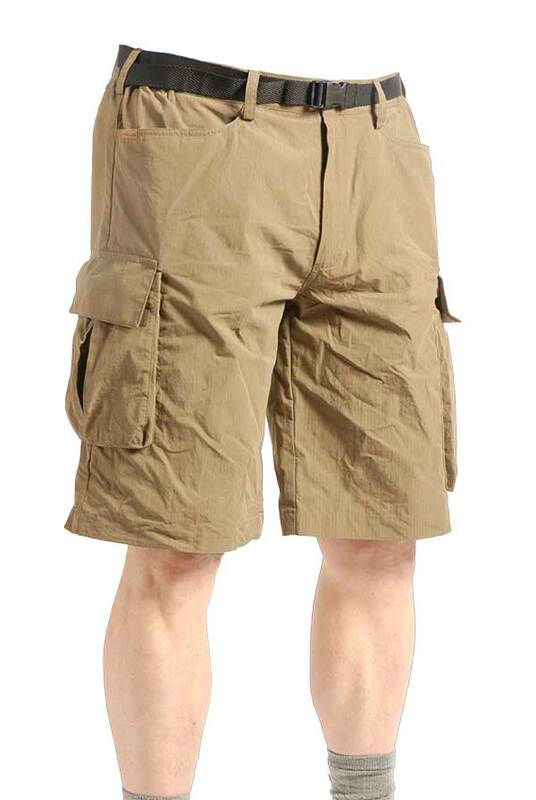 The pockets are good but some shorts offer even better access to maps on the move while wearing a pack, as the map-sized pockets are slightly better placed. The pocket bags are mesh, which means small items could start to break through them, so again shorts with different fabrics in the pocket may be more durable. 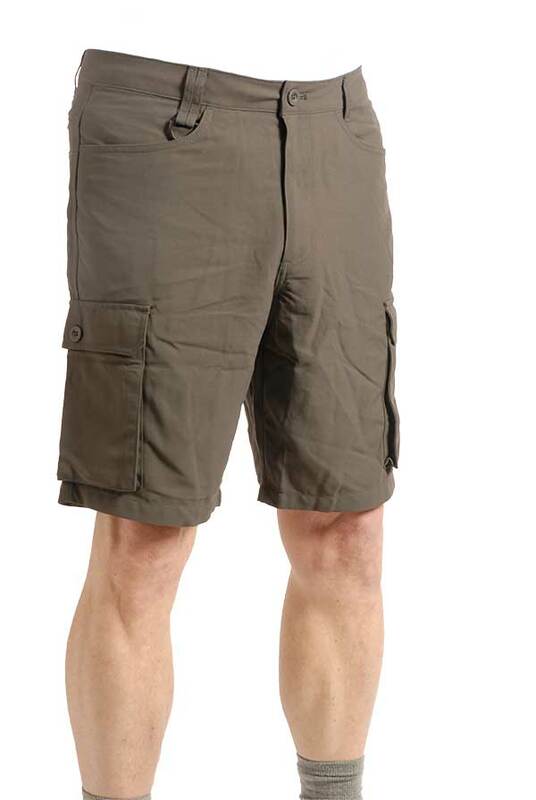 Stretchy shorts with good pockets for hillwalking and backpacking, with only small details that may niggle. This fabric is very, very hard-wearing. It feels like a cotton canvas, but is made from nylon which is more durable and faster drying. There’s also a very good selection of pockets, including a zipped and semi-hidden pocket in the rear as well as another fully hidden zipped pocket on the right hip. Six other pockets are wide enough for maps, with two taking a map fully, while the other four take a map quite well but not to full depth. The waist has belt loops. These are good workhorse shorts, and the price is pretty good for what you get too. Annoyingly there is no women’s version of these shorts, and the material has no stretch. The waistband has no belt, no stretch and doesn’t get the soft, brushed lining that others offer. The pockets are very good but they’d provide even better stowage of an OS map if they were slightly deeper in the case of the rear two pockets and the patch thigh pockets. The fabric is a bit heavier than others and slightly slower drying due to its thickness, so these aren’t the lightest to carry. 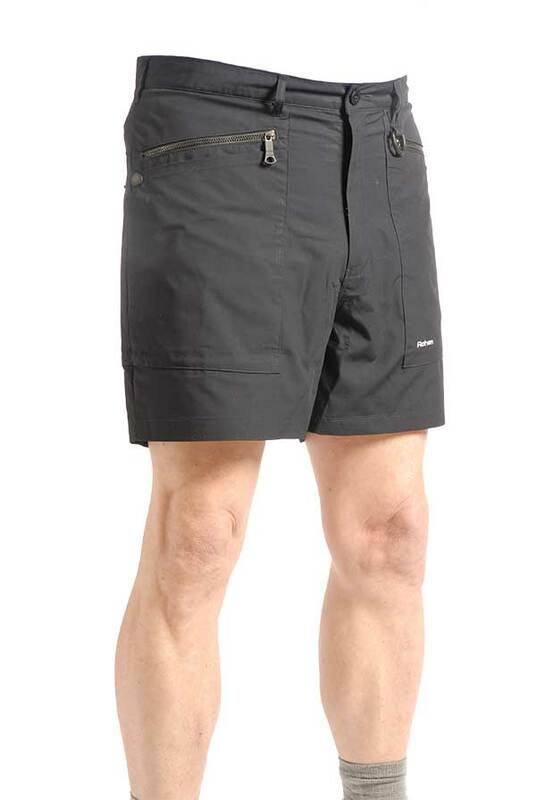 Excellent tough walking/backpacking shorts with better pockets than others. Slightly heavy to carry. The nylon Isotex fabric has lots of stretch, which makes these very comfy, but also it’s light, reasonably water-resistant, fast-drying and quite durable. There are belt loops and a belt, plus elastication at the waist, so on trips if you lose weight they will still fit. The three front pockets are all zipped, with two of them taking an OS map fully and the third fitting a map halfway down. There is a rear zipped pocket for keeping a small item secure. A good combination of features if you rank pocket design as a priority and want a stretchy fabric. There is no diamond crotch panel here, so others have a little more space between the legs, but the stretch fabric does at least allow more freedom of movement. Also while the waist is very adjustable it does not get the smooth brushed lining that others in this price band offer. You can get even more durability in some other designs, but those options may lack the stretch offered here. Slightly pricey considering some of the drawbacks of the design. Very stretchy nylon, lots of adjustment in the waist and good zipped pockets, but the price tag is relatively high. Recycled nylon from products such as fishing nets forms the main fabric here, with some elastane to improve stretch. The result is a thin, lightweight fabric with lots of stretch that feels hard-wearing, resists water well, and is fast-drying. An extra panel in the crotch provides comfort, and the wide waistband has a fitted belt. The two main pockets on the front easily take a map, and are placed below a rucksack hipbelt for easier access. There is also is a third zipped leg pocket that takes three quarters of a map’s length at least. It is a pity the zipped leg pocket is not deeper so it could fully take an OS map or guidebook of similar size. The rear pocket is not zipped and again not deep enough to fully take a map, so it’s neither deep enough for a map nor secure enough for valuables. Some shorts have a heavier fabric that is more abrasion-resistant and also even more pockets. The waistband is good but others have elastication or a softer lining. The price seems a little high compared to others. Like other products in the Abisko range, these shorts use G-1000 fabric that can be treated with wax for better durability, water and wind resistance. This material is placed in the darker areas such as the seat. The rest is a stretchy nylon mix that also feels very robust. The waistband is lined, and is higher at the back for more comfort under rucksack belts. Two of the four front pockets have zips, and an OS map fits in three of these, while a small pocket will take a phone or GPS receiver. A big diamond crotch panel improves the freedom of movement, and the women’s Nikka also comes in Curve Fit option. Belt loops allow the fit to be adjusted but you don’t get a belt, and an elasticated waist could make this area even more comfortable. Some shorts at this price point have a softer lining in the waistband too. It’s a shame more of the G-1000 fabric isn’t used across the shorts for more durability, and if the right leg patch pocket was 2cm deeper you could secure the press-stud flap to hold a map securely. A good set of pockets and high durability, but that price tag is challenging.